Uncontested Divorce - Stacey Balduf, Esq. Uncontested Divorce or Contested Divorce…what do you really know? Most people are aware that there are two main types of divorces in NY: Uncontested and Contested Divorces. But are you aware that both uncontested and contested divorces require a law suit and the same paperwork. Are you aware that documents signed by the parties are only enforceable if correctly drafted or that going to Court with the right attorney can also help your case and is nothing to be “afraid” of. An uncontested divorce involves both parties agreeing to every single aspect of the divorce including issues surrounding dividing assets, child support and custody and spousal maintenance often known as alimony. A contested divorce on the other hand is when the parties don’t agree on one or more of the issues. Yes, it only takes ONE issue that you can’t quite work out the details for–to make a divorce contested. Obtaining a divorce is an emotional and stressful process. Even if you believe that your divorce will be “uncontested,” meaning that your spouse will agree to the divorce, there are many issues beyond simply ending the marriage that you have to think about before you work out your details. Are you sure you know all the options and consequences of your choices? That is what having legal advice can do for you. Consulting with or retaining an attorney is always a smart thing to do. I can make sure that your legal rights are protected and can assist you with any issues that may arise throughout the course of your divorce. There are no “do overs” so you want to make sure that you get this right. The parties agree to what will happen with the many items necessary to reach a written settlement or separation agreement. These items include but are not limited to, custody, child support, alimony or maintenance, houses, cars, insurance, debts, retirements, personal property, pets. Resolving these issues must be in the proper format and follow the NY State legal requirements. All agreements are subject to a Judge’s review. This cannot be a document you whip up yourself. Many clients often start out thinking that as long as you both agree it can automatically be so. Unfortunately, this is not true in NY. Obtaining a divorce in New York is very complicated and involves filling out and filing many court forms, even if your divorce is uncontested. An uncontested divorce is still a law suit in the State of New York and follows the same requirements as a contested divorce. You begin by preparing and filing a Summons with Notice and Verified Complaint, Barriers Affidavit and purchasing an Index Number from the clerk. The written and filed Settlement Agreement that resolves all of the equitable distribution issues, custody or maintenance is attached. The filing fees are the same for both contested and uncontested divorces you purchase Index Numbers, RJI Numbers and Trial Note of Issues for each type of divorce. You have to “serve,” or get your spouse a copy of the summons and complaint (if you filed one) within 120 days of the date you filed. An additional Affidavit is prepared and then filed with the Court that proves this service. If your spouse agrees to the divorce an affidavit can be prepared for him or her to sign or your spouse simply does not answer the papers and a default uncontested divorce can then be obtained without going to court. If your spouse files a “Notice of Appearance” and disagrees with any part of your divorce papers, then your divorce is no longer uncontested. If your spouse signed the affidavit of defendant or does not answer after approximately 40 days you can put your divorce on the matrimonial calendar. USC 111 – Divorce and Child Support Summary Form. 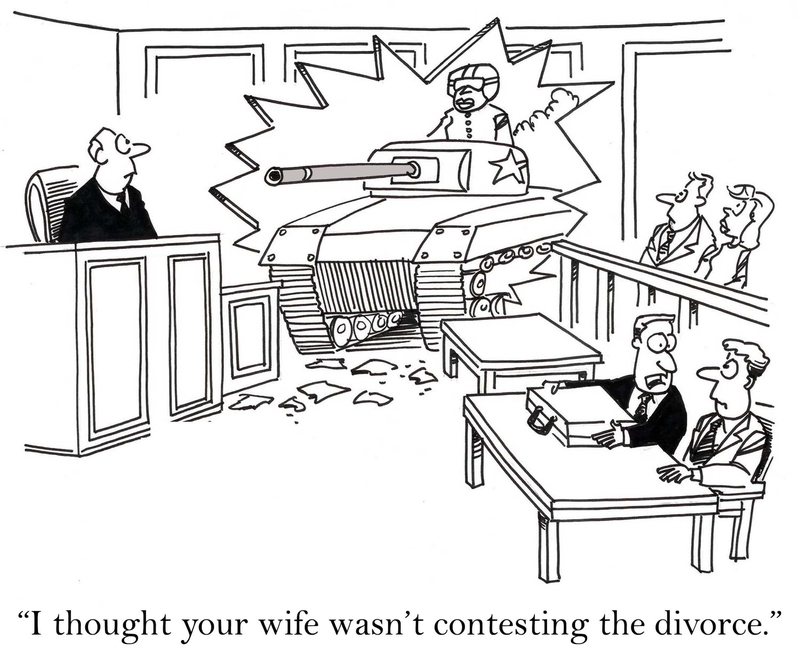 After submission the Court will take anywhere from 2 to 12 weeks to review and sign your Judgment of Divorce. But you are still not done. In NY the divorce is not filed until those papers are picked up and a Certification Form is provided and they are filed with the clerk. A contested divorce follows the same process only since you have not agreed on all of the issues necessary to prepare a written settlement agreement you will be filing for court intervention after the initial papers are served. You will then go to court where the process is often set up to offer the opportunity to discuss and settle issues that are preventing settlement. Ultimately, a settlement will either be reached or a trial or hearing held where the Court will settle the issues. Once the issues are settled the paperwork set forth above is submitted. With the right attorney the Court process is nothing to be afraid of and will have the necessary result to complete your divorce. It is interesting to note that the Court does not prepare even its own documents. They are provided by the attorneys.